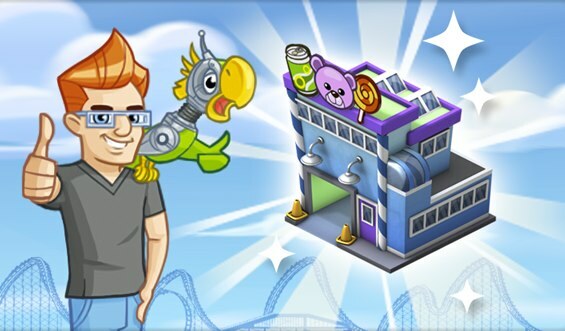 If you're interested in skipping the Goods ordering in CoasterVille so that you can save your coins (and time) for other things, you might be interested in the new Goods Factory that has been released in the game's store. This Goods Factory costs 125 Park Cash to unlock, which is a little less than $20 USD, if you purchase Park Cash at its normal price. This Goods Factory looks to take up the same amount of space as the normal Goods Emporium, but it works automatically, producing Goods every second of every day, so long as you continue to collect from it at least once every 24 hours. Once per day, you can collect from the Goods Emporium, receiving a guaranteed 490 Goods with each collection. For reference, a single package of 360 Goods costs 10 Park Cash, so while the Goods Factory might be expensive, if you were routinely purchasing Goods anyway, you'll definitely save money on this investment in the long run. This Goods Factory does nothing to the original Goods Emporium, so feel free to continue to use that free method of Goods generation if you don't want to invest the Park Cash in this Factory. Whatever your choice, it's nice to see Zynga offering other options for player advancement, but let's just hope that the next release is a little friendlier on the wallet. What do you think of this Goods Factory? Will you purchase one for your park, or are you fine collecting Goods over time the old fashioned way? Sound off in the comments!